One of the oldest communities in the Midwest, the Grosse Pointe area was settled in the mid-1600s and became a small farming community in the 1700s. With steamboat travel and later the automobile, the area become a popular summer resort for wealthy Detroit businessmen who later built permanent homes and architecturally significant estates, some of which remain today. In 1911, the Village of Grosse Pointe Shores was incorporated with a population of approximately 350 residents. On April 1, 2009, the village was incorporated as a city named the “Village of Grosse Pointe Shores, A Michigan City” with approximately 1,100 households and 3,000 residents. For more information on the rich history of the area, see the Grosse Pointe Historical Society website www.gphistorical.org. Today, Grosse Pointe Shores is a picturesque family-friendly city, well known for the exceptional views of Lake St. Clair. City residents enjoy excellent city services and quality of life. With award winning trees and landscaping, the city is committed to maintaining and enhancing the beauty of the community. Zoned entirely as single family households, the homes range in price, size and architecture from affordable, well maintained single family homes to breathtaking historic mansions. The beautiful Municipal Building was designed by famed architect Albert Kahn. 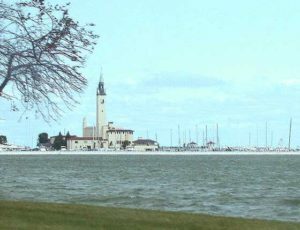 In addition to the local park, marina and lakeshore views, residents enjoy the convenience of shopping, dining, world class medical care, highly rated K-12 public, private and parochial schools, state of the art library services, small businesses, community services, churches, local arts and cultural activities, and amenities in and around the Grosse Pointes. A short 15-20 minute commute to Detroit affords residents access to world class business organizations, arts and culture, educational, and major league sports institutions. Source: Official Website of Grosse Pointe Shores, MI. Copyright © 2016 (Grosse Pointe Shores, MI). All Rights Reserved.